Heat oven to 350°F (180°C) for shiny metal pan or 325°F (160°C) for dark or non-stick baking pan. Make and cool brownie mix as directed on package directions. Cut brownies into 6 rectangular pieces. Cut each piece diagonally in half. Heat coals or gas grill for direct heat. Mix butter, orange juice and brown sugar in small bowl. Thread pineapple, mango, and banana pieces alternately on each of twelve 10-inch (25 cm) skewers, leaving space between each piece. Brush fruit with butter mixture. Grill fruit uncovered on medium low heat 10 to 15 minutes, turning frequently and brushing with butter mixture, until fruit is lightly browned. To serve, arrange 2 brownie triangles on each plate. 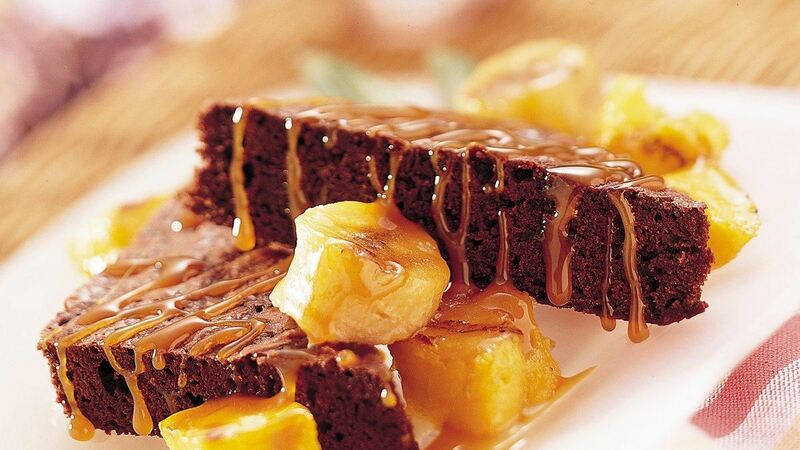 Remove fruit from skewers and arrange around and over brownies. Drizzle with caramel topping. Do-Ahead Tip: If using bamboo skewers, soak in water at least 30 minutes before using to prevent burning. Buy bananas that are ripe but still firm enough to withstand grilling. The grilling brings out the natural sweetness.